Need something new to get you excited about hitting the gym? Get in shape today by learning about the latest workout trends. 1. Strength training—Important for everyone, strength training is just as necessary as an aerobic workout. As you age, you naturally lose muscle mass, and as this happens your percentage of fat increases. Strength training helps maintain strong bones, reduces your chance of injury and manages your weight. 2. Body-weight training—Want to save money? The latest, and least expensive, exercise trend only requires the weight of your own body. Body-weight exercises offer a back-to-basics work out that includes activities such as push-ups, pull-ups, planks and squats. 3. Functional fitness—Need to be able to lift your toddler or rake some leaves, without feeling sore for days? Then functional fitness is the trend for you. These strength-training exercises look to build your muscles to work together to perform real life tasks. The workouts are great for people of all ages, but can be very beneficial for older adults. 4. Core training—Building your core muscles is a great way to improve your posture and fend off lower back issues. Whether you use equipment like balance balls and wobble boards or take a Pilates class, core training works the hips, lower back and stomach to improve your stability during everyday movements like bending, reaching and stretching. 5. Group personal training—Want to work out with a personal trainer, but think you can’t afford it? 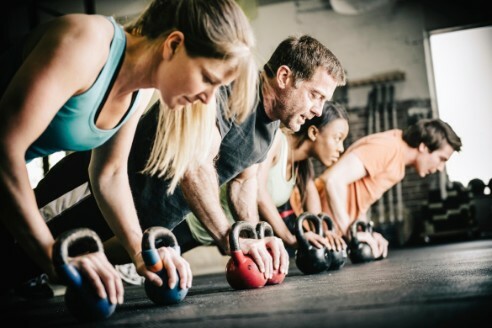 A recent fitness trend may be just what you are looking for. Personal trainers are offering sessions for small groups of people—from two to four—that provide a customized experience without the high price tag. After trying out these latest fitness trends be sure to give Massage For Health And Fitness a call for a sports massage. Not only will it help promote your flexibility to decrease your risk of injury, but also it improves your overall endurance. Studies indicate that post-workout out massages reduce your recovery time and offer balance to those who are training for a race. Massage For Health And Fitness offers a variety of massages that helps improve your overall health and fitness. See the service page for a complete list of Massage services.